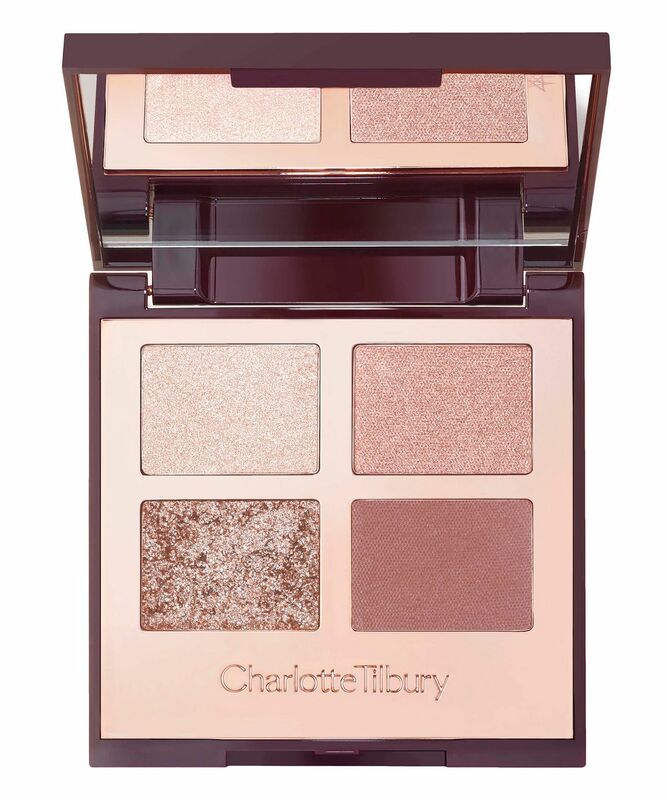 Inspired by sparkling, eye-widening social media filters, this dreamy new palette from Charlotte Tilbury does exactly what its name implies (in the most sublime way possible), giving you bigger, brighter eyes with ‘Prime’, ‘Enlarge’, ‘Define’ and ‘Pop’ shades. The covetable quad contains complementing, velvety textures powders to enhance your natural eyes: ‘Exagger-Eyes’ stars ivory-cream, rose golden, red-brown and transparent sparkle shades. You know those big, sparkling eyes you get with the help of Instagram and Snapchat filters? (If you don’t, they’re universally flattering photo filters) Charlotte Tilbury’s Luxury Palette - Exaggereyes lets you channel this look in real life. Effortlessly easy to master, these sumptuous quartets feature four velvety smooth powders in complementary tones designed to ‘Prime’, ‘Enlarge’, ‘Define’ and ‘Pop’ when applied to lids. Carefully curated, this ingenious selection will help you create eyes that look wider and brighter, whatever colour they are. ‘Exagger-Eyes’ stars ivory-cream, rose golden, red-brown and transparent sparkle shades. 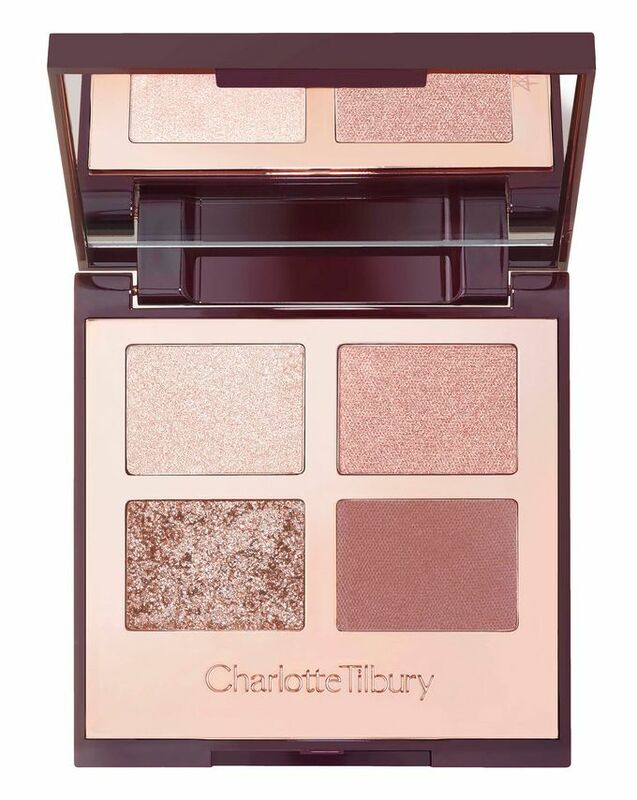 Another make up marvel from the queen of the scene, Charlotte Tilbury. 1. To use, apply the prime shade all over your eyes with your blender brush, and use your smudger brush to focus on the inner corners of your eyelids. 2. Apply the enlarge shade using your blender brush. You can wash it across the eye lightly or build up in the crease for a lightly-contoured effect. 3. Add instant definition by applying the Define shade along your lash line to create the illusion of brighter eyes. 4. A wash of the transparent sparkle shade will create wider and brighter-looking eyes by applying with your ring finger to the centre of your eyelid. Enhance Ingredients:Talc, Mica, Dimethicone, Octyldodecyl Stearoyl Stearate, Zinc Stearate, Zea Mays (Corn) Starch, Silica, Pentaerythrityl Tetraisostearate, Potassium Sorbate, Chlorphenesin, Tetrasodium Edta, Tin Oxide, Titanium Dioxide (Ci 77891), Iron Oxides (Ci 77491, Ci 77492, Ci 77499). Smoke Ingredients: Talc, Zinc Stearate, Mica, Dimethicone, Zea Mays (Corn) Starch, Silica, Pentaerythrityl Tetraisostearate, Octyldodecyl Stearoyl Stearate, Potassium Sorbate, Chlorphenesin, Tetrasodium Edta, Iron Oxides (Ci 77491, Ci 77492, Ci 77499), Carmine (Ci 75470), Ultramarines (Ci 77007). I purchased this on a whim and I'm obsessed with it. It's my go-to for work while the absolutely gorgeous shimmer shade is used if I have an after-work event! I think that this palette is perfect for daily makeup. I'm in love with the sparkle! This palette looks very similar to the Pillow talk palette and I have both. If you have to choose, just get this palette instead. The shades are very flattering, easy to blend and it's a good everyday palette for when you don't want to look too made up. It’s easy to use because of the great combination of colors. Very useful from daily looks to dramatic looks. The colours in this palette are very gentle, creating a sense of young modern British girl. I know a lot of people are crazy about Charlotte Tilbury's big sequins, but in this palette it without a base colour, and when you apply it to your eyelids, it looks kind of goofy, which I personally don't like so much. I usually add a layer on top of big sequins from other palettes to make my eye makeup look more rich and shiny. Sorry, I rewrote it. Patchy loads of fall out overpriced so many cheaper pallets are better than this would not advise for anyone unless under the age of 3 !! Love this palette, perfect for everyday and for bridal makeup. Insane! I love this palette, I used it everyday!! So I was desperate to try this as I like the pillow talk palette. This is a really nice palette don’t get me wrong but it is mostly shimmer which isn’t great for day wear. I’ve reached for it more than twice . Bought this as a Christmas present for myself and it is absolutely stunning! I would recommend to anyone getting into Charlotte Tilbury to start with this. So easy to use and definitely an eye-catching product. I’m a huge fan of CT and I’ve been using her makeup for 2-3 years now and for me, the quality is just amazing! This eye palette is no different, I bought the Transformereyes colour and it’s just beautiful! The colour is intense and the quality of the pigment is perfect. I recommend this product! Beats Pillow Talk by a mile! Absolutely love this palette, I use it daily. It gives me an amazing sparkle to the eyes and is more wearable and natural than Pillow Talk. If you are deliberating on which on to buy get this one, you won't be disappointed! The colors are good, but it didn’t makes me want to use it every day. The colours in this palette are very gentle, creating a sense of young professional British girl. I know a lot of people are crazy about Charlotte Tilbury's big sequins, but in this palette it without a base colour, and when you apply it to your eyelids, it looks kind of goofy, which I personally don't like so much. Usually I use the big sequins in the other palette to add another layer, so that the eye makeup looks more rich and shiny. I usually add a layer on top of big sequins from other palettes to make my eye makeup look more rich and shiny. Pretty nice yet somewhat unexciting. Pros: Pretty, easy for everyday wear, fairly inoffensive and office-appropriate. Cons: Not particularly versatile (not that you'd expect it, based on how it looks), you probably already have these colours in your collection (I'd expect more than once). Verdict: Get it if you like these shades and want them all in one (fairly compact) palette. Pass if you're not too excited about them and/or have several repeats; the formula isn't so amazing/ revolutionary/ life changing to warrant a "you must get this regardless!". This palette is absolutely gorgeous! This has to be my most used eye shadow palette EVER. I get use out of every shade and can rely on just this no matter the occasion. The colour pay off is beautiful and they are all so blendable you could use for just a subtle wash of colour or a full glamorous evening look. It is literally fool proof, trust me you need it. Chic shadows. The pigment is super easy to shade. CT is life!! I introduced myself to Charlotte Tilbury products at the starting of 2018. Exactly 1 year since today. I have never looked at any other brand after that for the eye palettes, the lip cheats, lip sticks and foundation and of course the magic cream. I was blown away how beautiful the ExaggerEyes palette is and has great pigmentation. The colors complement my Indian skin tone perfectly. Just waiting for the pillow talk to launch. I recommend this one to anyone who wants a subtle glow on their eyes. It’s been a while since I last used an Charlotte Tilbury eye palette but this one caught my eye because of it’s prettiness and the claims to make eyes bigger and brighter. The 4 colours are subtle but also long wearing. The claims to make eyes bigger and brighter are completely untrue, you can get far better eyeshadows which really do do this with the correct application. That being said, all of the 4 colours are pretty and I’ll probably use this palette in the summer. If you don’t like shimmery eyeshadows this palette is definitely not for you, it is very shimmery! Once again, Charlotte Tilbury makes makeup to make women look beautiful. This is more suited towards a bit tanner skin tones since it’s more golden. I love it. Even though there isn't a pop shade in this, it is not the least bit lacklustre. Summer favourite.